With 284 million active users, Twitter is the one of the most frequented social media site today, outranking LinkedIn and Google Plus and second only to Facebook. Research shows that of Twitter’s millions of users, 42% are following brands or companies. If you are a business owner, Twitter can be a valuable player in your social media marketing plan. 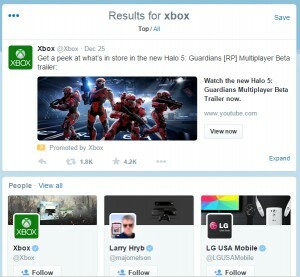 There are three main kinds of ads you can use on Twitter: Promoted Tweets, Promoted Trends, and Promoted Accounts. We’ll start by discussing Promoted Tweets, which have risen in popularity since their launch in 2010 and are now used by 79% of marketers in the US. Drive a particular action. For instance, you may want people to take advantage of a deal on a product or sign up for an event you are hosting. Twitter can help connect you with more qualified leads. Build brand awareness. It’s often harder to measure than the first goal, but you can expand the reach of your content marketing campaigns and connect your business with influencers and advocates. Sound good? Happily, a Promoted Tweets marketing campaign is relatively affordable and straightforward to set up. 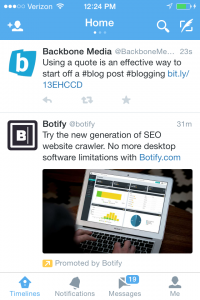 Here’s a step-by-step guide to setting up Promoted Tweets for your business. After logging in to your Twitter account, visit your Twitter ad campaign dashboard and click on “create new campaign”. To create a Promoted Tweet, you should select the “Tweet engagements” option. On the next screen, you’ll be presented with a series of questions to start setting up your campaign. First, you’ll be asked for a campaign name and what dates you want your ad to run. Be succinct. While Tweets can be up to 140 characters in length, studies have shown that staying below 100 characters can increase engagement. If you need to share more information, opt to create multiple Tweets rather than trying to squeeze all that info into a single one. Include quality media. In general, Tweets with videos and images tend to drive much higher user engagement. Studies have shown that Promoted Tweets with quality media receive as much as 313 percent more engagement and 52 percent more retweets. Take advantage of the Vine feature, which allows you create brief video snippets or add up to four images. Be conversational. Promoted Tweets are a great way to share your company’s personality. Feature content that you think will engage users and inspire conversation. Update frequently. Fresh content performs better on most social networks, but that’s particularly true on Twitter which is a fast-moving platform where users provide updates more frequently. Don’t use ALL CAPS or shortcuts. Some advertisers make the mistake of capitalizing all the letters in their updates, but this will make it appear like spam. Similarly, using shortcuts like “4” instead of writing out “for” can also appear spammy. You don’t have to avoid the practice altogether, but do so sparingly. 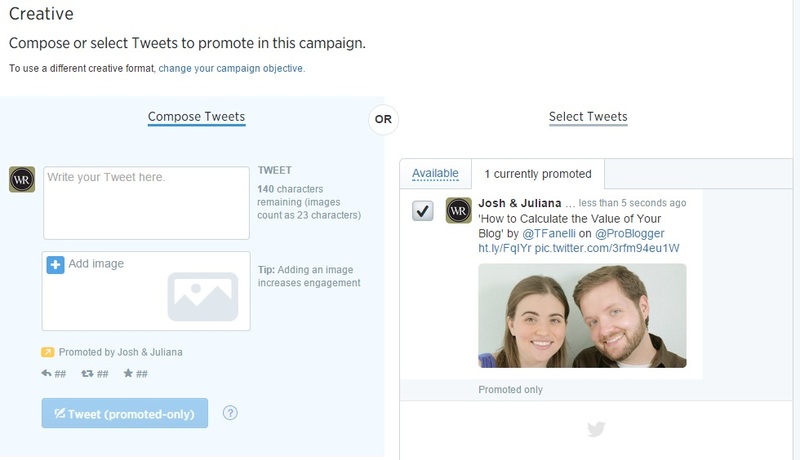 Next, set your targeting criteria to determine who will see your Promoted Tweet. You can target users in a geographical area, a certain gender, or viewers using a particular type of device— such as computers or mobile devices from a specific mobile carrier. Keyword. Targeting by keyword will allow you to reach users based on keywords in their searches, recent Tweets, and Tweets with which they recently interacted. You can choose if you want a broad match—which will include your keywords in any order, related terms, misspellings, and slang—or exact phrase matching. If you like, you can broaden your reach by choosing to include additional common related keywords recommended by Twitter. Followers. If you opt for follower targeting, you can reach users who have similar interests to the users you list. Interests. If you add target interests, your ad can reach users interested in any of the categories you choose. Tailored audiences. If you have already created your own lists of customer emails, Twitter IDs, or mobile advertising IDs, you can apply these to your campaign. You also have the option of putting a code on your company site, which will track visitors, customers, and downloaders to target in the future. I shared more in-depth tips on how to use this powerful feature in a past blog post. What targeting options are right for me? If you are hoping to catch the attention of new customers or promote your company, targeting by interests and followers might be your best bet. If you want to focus on users who you think might be interested making a purchase, targeting by keywords will give you a smaller but more suitable audience. Lastly, you’ll be asked to determine a budget. 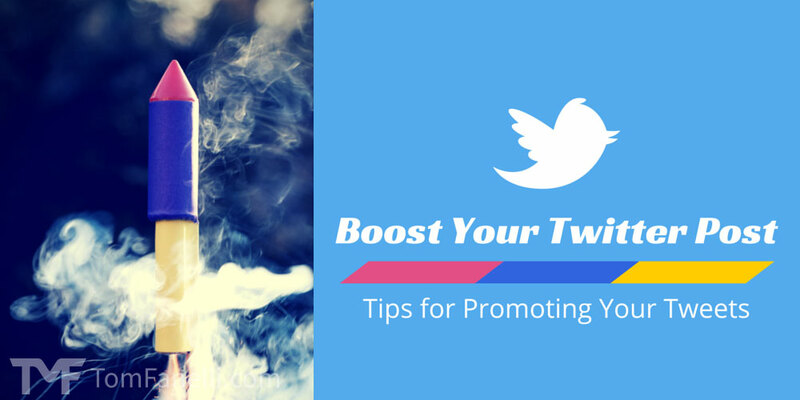 You can choose the maximum amount of money you want to spend on your Promoted Tweet per day. You may also choose whether you want Twitter to automatically enter bids to optimize your campaign, or decide your own maximum bid. Finally, you have to option of setting a budget for the entire campaign, which will put a halt to the campaign once the cap is reached. Consider your ROI. If a single conversion brings in hundreds in revenue, then you can afford a very high cost-per-click, which can help bring you more opportunities to earn that single conversion. But if your return will be much lower per conversion, then set a budget that ensures you’re not spending more than you’re earning from the campaign. Revisit your recommended maximum bid. To start, Twitter recommends a maximum bid using data from all advertisers across Twitter, but as your campaign begins, it will use data from your ad’s specific performance and will adjust its recommendation accordingly. So it makes sense to come back after a week or so to see if their recommendation has changed. 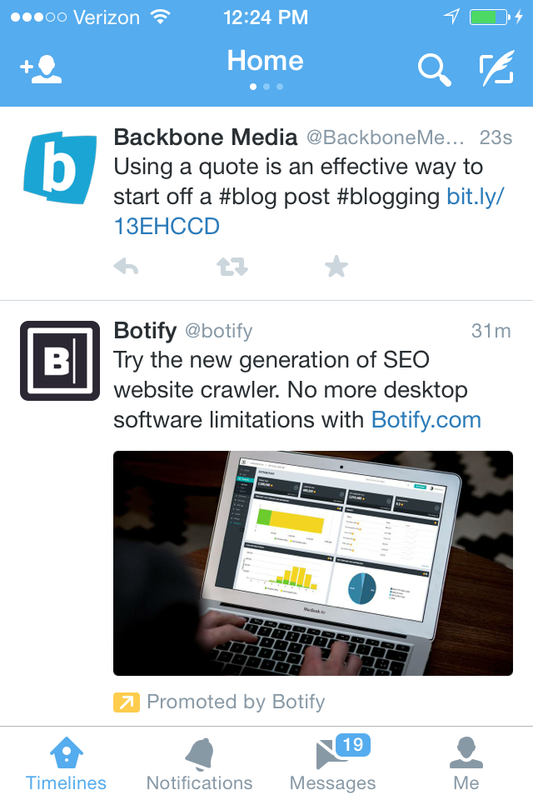 After you launch your campaign, your Promoted Tweet will show up in the home timeline of the users you’ve targeted. You can track how your campaign performs by monitoring activity in your campaign manager dashboard. As I’ve been known to advise, it’s important to constantly experiment with new content and targeting parameters in order to find determine what tactics will bring your marketing campaign the most success. Set a reminder to check in regularly, once a month or at least once a quarter. A/B testing is one of the most powerful tools at your disposal, and it’s the only way to truly know how to improve your campaign.